Archive for the ‘Gravenhurst Ontario’ Category. 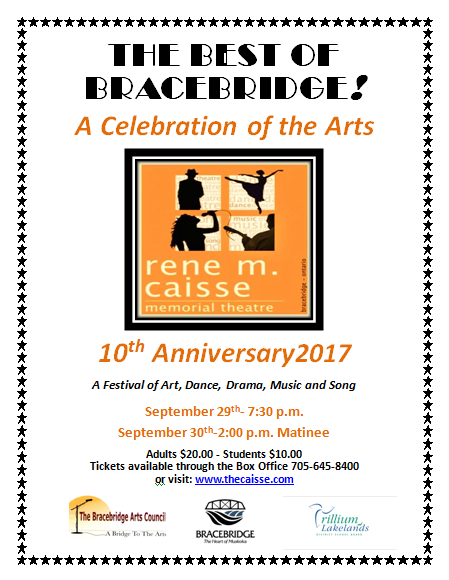 A Festival of the Arts to celebrate the 10th anniversary of the ReneM Caisse Memorial Theatre. It will be a grand production of art, photography, dance, drama, music and song by talented local artists of all ages. On Thursday, April 13 at 9am-12pm, join us for the 2014 Cut-A-Thon For Parkinson’s. 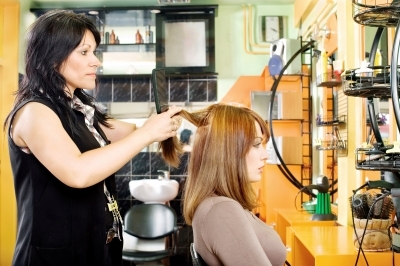 For only $35 receive a wash, cut & blow dry, plus gift bag courtesy of our sponsor JOICO. We’ll be at the Classy Cuts Salon & Spa, 97 Manitoba St., Bracebridge. To book an appointment please contact Cathy Anderson at 705-645-8822. Due to the generosity of our participating salons and their talented stylists, all funds raised through Cut A Thon for Parkinson’s are put towards research, advocacy, education and support services for Canadians living with Parkinson’s and their caregivers. Come out and enjoy a great concert this Tuesday, April 11, at 8:00 p.m. – The Muskoka Concert Association presents Sonic Escape Trio. A flute-violin-cello trio of Juilliard graduates that uses the whole performer – fingers, mind, voice & story – to reshape the live music experience. These virtuosos have traveled the world in diverse roles such as soloing at Carnegie Hall, fiddle-dancing in Riverdance, jamming with Beale Street blues bands and playing rock clubs. Whether performing one of their original works or a masterpiece from classical and world music repertoire, Sonic Escape performs as though it’s the last note they’ll ever play for the best friend they’ll ever make! Friends of Muskoka Midwives presents Mindful Parenting Symposium this coming Saturday, April 5 -from 9am to 3pm at the Bracebridge & Muskoka Lakes Secondary School, 100 Clearbrook Trail. An entertaining and informative one-day event for both parents/caregivers and industry professionals. A locally-sourced lunch is included with the cost of registration and child care is available (spaces are limited). Parents & caregivers will enjoy a keynote by best selling author Ann Douglas, workshops covering topics such as children’s mental health, vaccines, connecting your child with nature, and tools & tips for parenting mindfully. Industry professionals can join in the interactive presentation on “The Fourth Trimester: Birthing Our Babies, Birthing Ourselves” – a series of dynamic workshops facilitated by Tracy Peters, a holistic coach and counselor. Advance registration at www.mindfulparentingmuskoka.com is highly recommended! Single registration – $20/person. Couple registration – $35/couple. Industry Professionals – $75/person. Lunch is included with all registration levels. 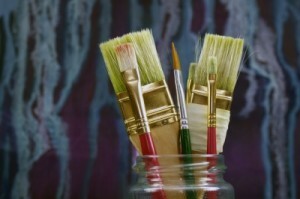 The Muskoka Arts and Crafts Inc. presents the 37th Annual Spring Members’ Show on the weekend of Friday, March 21 – 23. This is a gala exhibition of art and craft created by the members of Muskoka Arts and Crafts. Come to the Bracebridge Sportsplex, 110 Clearbrook Trail, Bracebridge. There will be an opening reception and awards on the Friday, March 21 from 7pm-10pm. Saturday and Sunday there will be art and craft demonstrations of art & craft techniques from 10am – 5pm on Saturday and 11am to 4pm on Sunday. Admission by donation. Free parking. For more information visit us on the web at, www.muskokaartsandcrafts.com or call (705) 645-5501. 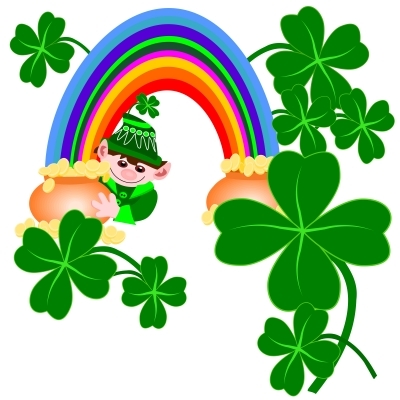 Come to the Bracebridge Public Library this Saturday, March 15 at 10am for Leaping Leprechauns St. Patrick’s Day activities and crafts. This is part of the Bracebridge Public Library’s March Break programs for School-age Children. For more information call (705) 645-4171, or visit them on the web at, www.bracebridgelibrary.ca. 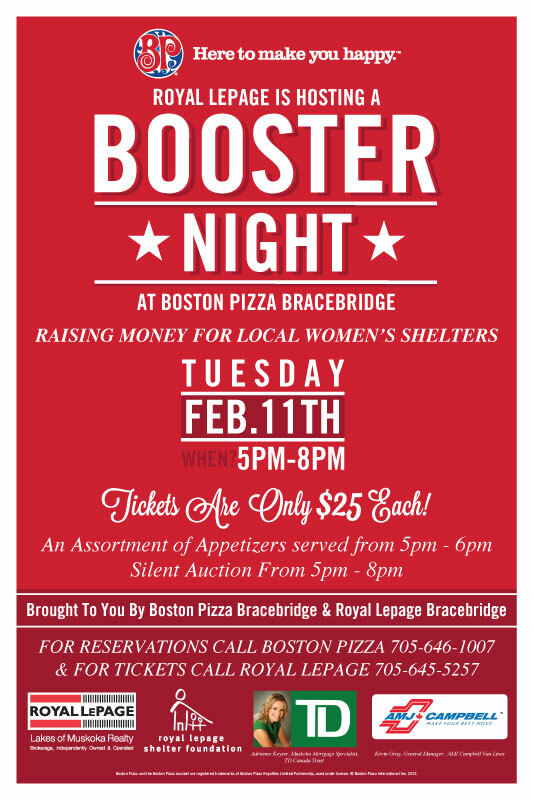 Please help Boston Pizza and Royal LePage of Bracebridge raise funds for the local women’s shelters this coming Tuesday night. 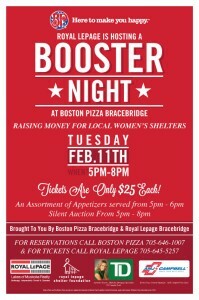 This Tuesday, February 11th from 5PM-8PM Boston Pizza will be hosting a silent auction. Tickets are $25 and include pasta or pizza. Appetizers, courtesy of AMJ Campbell Barrie and Adrienne Keyser TD Mobile Mortgage Specialist are from 5-6PM. For tickets or for more information please call 705-645-5257 . All proceeds go directly to the shelter, please help the women in your community by coming and supporting this great local cause. You are invited to Habitat for Humanity Muskoka’s Spring Fundraiser “Home Tweet Home”. There will be a Cocktail Reception, and Entertainment. The Silent & Live Auction starts at 7 pm. Arrangements have been made as a special offer to those who have purchased a ticket & who wish to play golf before the event. A number of tee times have been blocked off. Tickets are $60.00 each and the event is hosted at the Muskoka Bay Club in Gravenhurst (1217 North Muldrew Lake Rd Gravenhurst, ON). Event begins at 5:30pm on May 10, 2012. For more information call 705-646-0106 Ext. 6, email ellen@habitatmuskoka.com or visit www.habitatmuskoka.com. 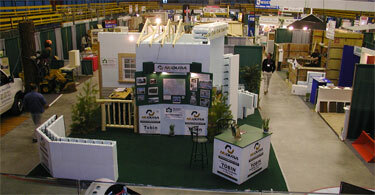 For the past 20 years, the Muskoka Builders’ Association has hosted the premiere Home Show in Muskoka. Held annually in late April, the Muskoka Home & Cottage Show is positioned at the start of the building and renovation season and offers consumers a wide selection of home building and renovation products and services. The 2012 Muskoka Builders’ Association Home & Cottage Show, our 21st Annual, will be held April 27-29, 2012. The Muskoka Builder’s Association is excited to be hosting our 2012 Home & Cottage Show at the newly renovated Gravenhurst Centennial Centre (101 Centennial Dr. Gravenhurst, Ontario). This facility offers ample parking for show visitors, as well as additional exhibit space, to increase the offering to show visitor. Admission is FREE with a donation to the Food Banks of Muskoka (cash or non-perishable food item). For more information visit www.muskokabuilders.com. Gravenhurst Winter Carnival …. Fun for Everyone! Mark your calendar for an action packed weekend full of fabulous winter fun. 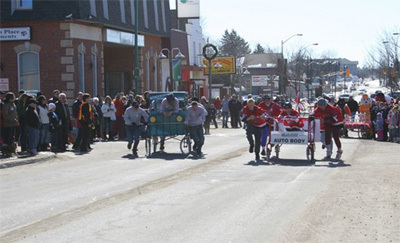 This longstanding tradition in Gravenhurst celebrates all that our community has to offer, and is sure to leave you with memories to last a lifetime. The Gravenhurst Winter Carnival hosts a variety of events including Snowmobile Radar Runs, Polar Bear Dip, Pancake Breakfasts, Ice Sculpting, Demolition Derby, live entertainment and so much more! 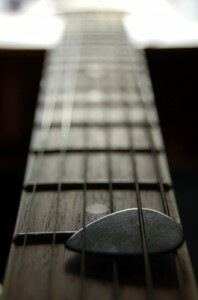 Join us on February 24th-26th, 2012 and experience Gravenhurst like never before. The Gravenhurst Winter Carnival is packed full of excitement. Opening Ceremonies Friday outside the Gravenhurst Opera House at 6:45pm. For more information visit www.gravenhurstwintercarnival.com.